Parasite wants revenge on Superman and is demolishing Metropolis until he shows up. Unfortunately Superman is in deep space, millions of miles away and only Aztek, Wonder Woman, Steel, Vibe, Hawkgirl, Firestorm, Huntress and Black Lightning can tackle his deadly foe. The adventure jumps back a few hours prior to Black Lightning's "teaching day job" in Suicide Slum and his chat with Marcus, a student of his. Marcus is having doubts that he'll ever make something of himself. Marcus points out that Lightning was the only 'hero' from the Slums to ever make a life for himself. How is it possible that he, a normal boy, can become a success too? Lighting points out that it's not about the powers, it's about the drive, the determination and inner strength, that's how to succeed in life. Of course this then leads onto a debate later on in the interior of the JLU Satellite. Firestorm and the other JLUers are in the canteen discussing how they'd cope with life's challenges if they weren't superheroes. Only Black Lightning admits he'd be just fine without his special talents, his conversation with Marcus weighing on his mind. 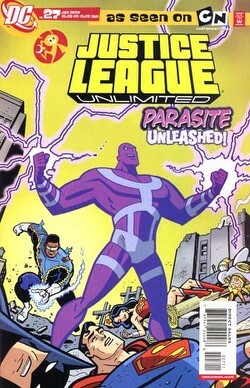 An alert to Parasite's attack breaks the levity and the JLU teleport to Earth. Within minutes of their arrival Rudy wipes them all out. Flame cages, tremors, toppling rooftops, bowling with the Daily Planet globe. Their powers amount to nothing against the power sapping villain. Lighting runs for cover while the Metropolis Police Dept. try to hold Rudy back. Hiding in the shadows Lightning hopes his power might regenerate. While hiding Lightning spots Marcus in the crowd. Despite the danger Marcus is helping the weak and less fortunate evacuate from the dangerous battleground. Obviously Lightning's pep talk had an effect on his student. Lightning is inspired himself and decides if his powers are drained he'd use his greatest weapon - his brain! Scouting around the rubble he spots a downed powerline. Using Wonder Woman's lasso to insulate himself he grabs the powerline, sneaks up on Parasite and electrocutes him with Metropolis' entire power supply. The force of the blow knocks Rudy out and slam-dunks him into the arms of a S.T.A.R Labs Power Draining Restraint. A week later Lighting is again teaching Marcus and grades his exam paper. A+! Shocked Marcus asks how he managed it. Lighting tells him it was because he worked hard and earned it. Marcus tells him he saw the League battling Parasite and if they didn't give up trying, how could he? Black Lightning has always been pretty cool however this story made him seem such an almighty snob, to his background, to his friends and ultimately to the reader! Art - 4: The art is looking as great as ever! However I think Black Lightning might need to go to an optician for that nasty squint he has! BTW did Green Lantern, John Stewart suit up in John Henry's armour? Is it just me or do they look like twins? Cover Art - 4: Great cover! Really sold the issue and also unfortunately docked it a point! Superman and Batman don't appear at all inside and that might lead fans of the animated series or those respective heroes to believe their favorite stars were taking part in a big smack down battle! Naughty! Also Parasite seems to have a mouth? Oh well with such consistently good covers I can accept being mislead just this once.